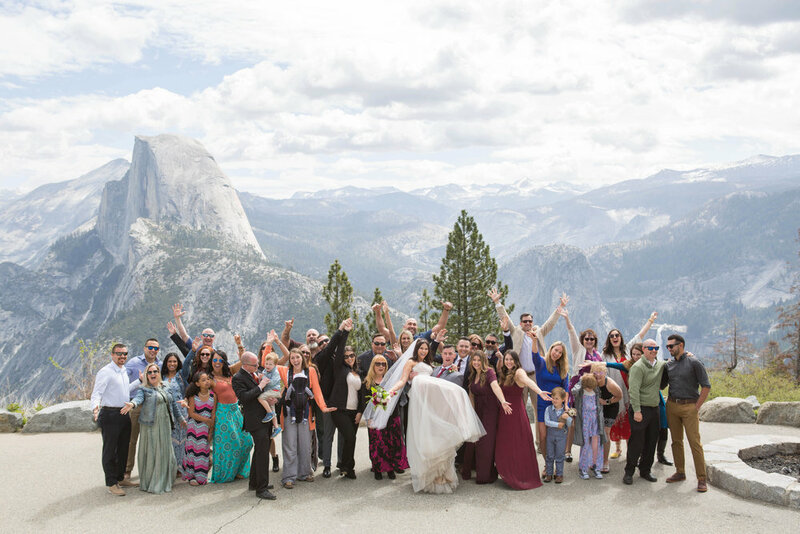 Since first posting photos from this top of the world wedding last month, I have been inundated with messages and questions about it. Did they really get married up there?! Did the bride carry her dress up, she didn't hike in it did she?! I thought I'd take a few minutes to answer some of those questions and share a bunch more of the coolest images from that epic day. Jeff and Ashley were referred to me by the mom of a senior client I had this year. If you remember when I went to Ft. Bragg for my birthday and did that engagement shoot at sunset on the beach?! That was this couple! I think it's safe to say they are just really, really photogenic people who had a good combo of picking the right places and trusting me with a lot of creative freedom. We got an early start with a 7am first look on the swinging bridge. OH. MY. GOD. The views here made the 40 degree temps and early hour totally tolerable. Plus how sweet was this. Click through for a few images from their first moments seeing each other. After they had a few minutes together we began the fist smaller hike of the day to Yosemite Falls. It was cold and yes, the bride got wet but she was such a trooper all day! 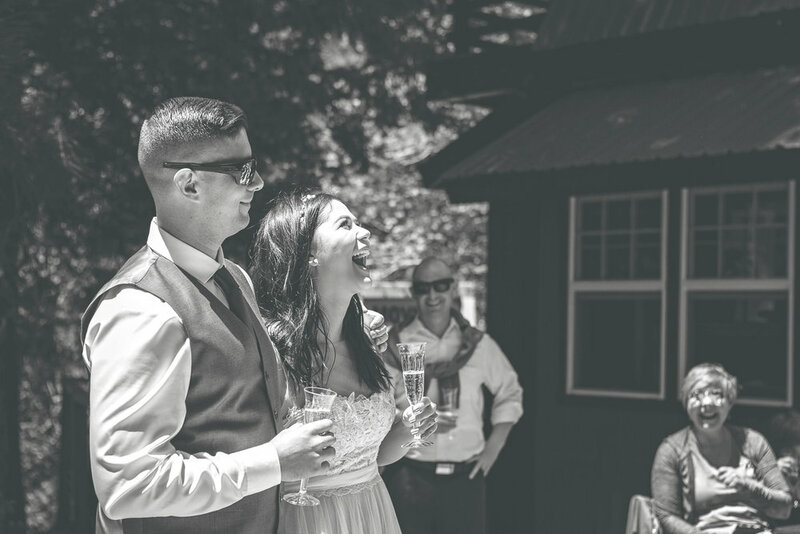 We also were able to fit in some photos in the valley before heading to their ceremony. At this point Kimberly and I pretty much lost it. Where else can you get these kinds of views?! The grass was wet and it was still cold but none of us cared. We had an hour drive to the ceremony spot after this so we turned the floor heater on in the jeep to dry our feet off on the way. The most common question I've gotten is whether they really got married "up there" - Yes! There were about 30 people in attendance and it was a long, windy drive to the ceremony spot but once we got there OH MY GOD the views. Oh! And Kimberly and I nearly missed the ceremony because we hiked around to the wrong side of the mountain. That is the most nervous I have EVER seen Kimberly at any event! When we arrived to the ceremony site my jaw literally dropped. Like in a cartoon. The views looked 100% like a painting and that's exactly what I said when I stood and looked out over everything. I can't imagine a more perfect backdrop for this intimate wedding. There really are no words to do it justice so I'll let the photos do the talking here! 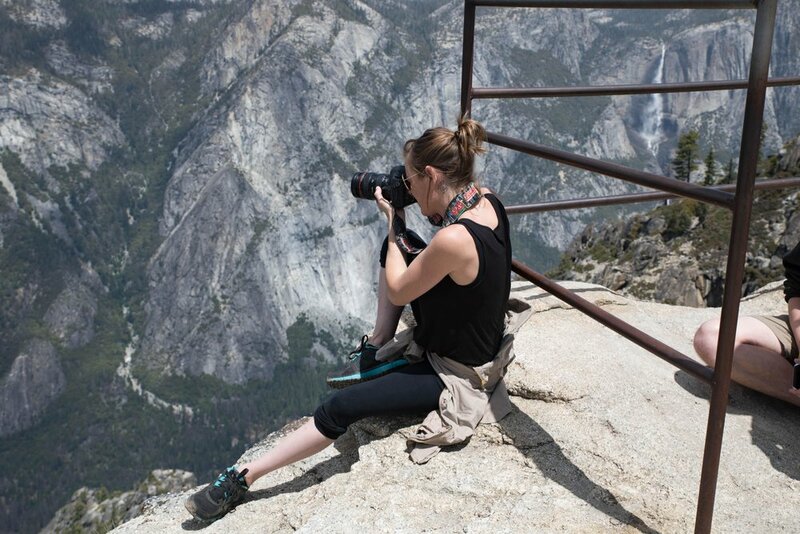 This is where some of my favorite photos were done, overlooking Half Dome with the most amazing sky I've ever seen. Here's where it gets REAL interesting! We began the hike that I was honestly pretty nervous about. The elevation seriously gets to me and I can struggle with asthma. This hike wasn't nearly as bad as I feared, two miles each way but at 7500 feet up it was still a challenge with camera gear and running on almost no sleep. And it was pretty warm! Ashley really did hike up in her wedding dress - she and Jeff both changed into hiking boots and just trucked on up through the mud and everything else. Click through for a few behind the scenes shots of our hike (taken while I was catching my breath lol). When we finally made it to the top I was even more floored than at the ceremony. From this vantage point we could see literally every spot we had been that day from the first look on up. It really is the most incredible experience to stand 7500 feet above the ground and look down. I'm not even afraid of heights but I'll admit my knees got a little wobbly! It was all worth it for these incredible photos. After all that hiking and the drive back down the mountain we were all ready to kick back! The guests were BBQing and relaxing at the house the couple rented, complete with a full bar and bartender. Let me tell you, if you ever want to get married in Yosemite you have GOT to rent the house these folks did for the reception. It featured a full bar, fire pit, and lots of room for everyone to move around. The friends and fam headed to the house to BBQ and relax while we did our long hike. When we made it back down the mountain we were greeted with champagne and snacks and meat on the grill. The full bar was staffed with a pro bartender so everyone could really enjoy the day and the bride and groom did a simple cake cutting as their only reception tradition. We left at that point but they had everything geared up for a full s'mores bar by the fire pit! And of course no wedding would be complete without the cake cutting... after all that Ashley of course couldn't be too mad about getting the cake smashed in her face, but especially not when she got the better shot ;) These two are just so fun! Huge congratulations to Mr. and Mrs. Emery! I am forever thankful for his military service, his service as a peace officer and for the adventures they have taken me on! In case you've forgotten their incredible beach engagement session you can see those photos here on my blog as well. And here are a couple last fun behind the scenes shots of me totally in my element!